Photographed near Rio Rico, Arizona, USA, July 2010. Posterior is at left and projecting from the center is the straight and rather sharp ovipositor. Eggs pass through the narrow channel within. On either side of the ovipositor are a pair of long soft, flexible cerci. These cerci and the very long flagella antennae assist night navigation and chemoreception. Sometime in the mid 1960's these insects began to appear in urban and agricultural districts of the Sonoran Desert. A native of southern Asia, they must have entered through some shipment of commerce. 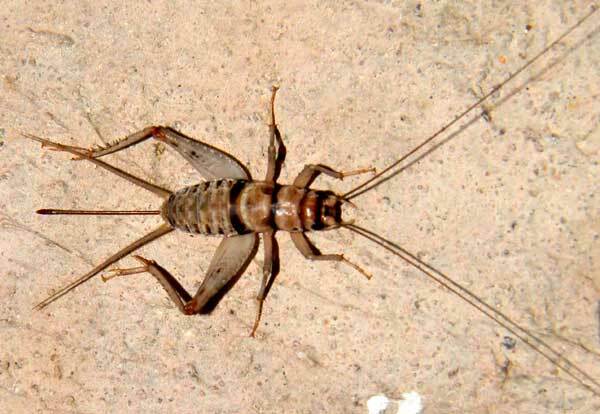 Tropical House Crickets readily enter homes and businesses where they are mostly a nuisance feeding on plant material, dead insects and food scraps. Females are wingless and males have short, mostly non-functional wings. Loud chirping sounds are produced only by adult male crickets as they stridulate (scrape) one chitinous wing against the other.